R.A.F. Chartboard, Type 'B', MK.2. Stores reference 6B/137. Manufactured by P.A.C. Ltd. 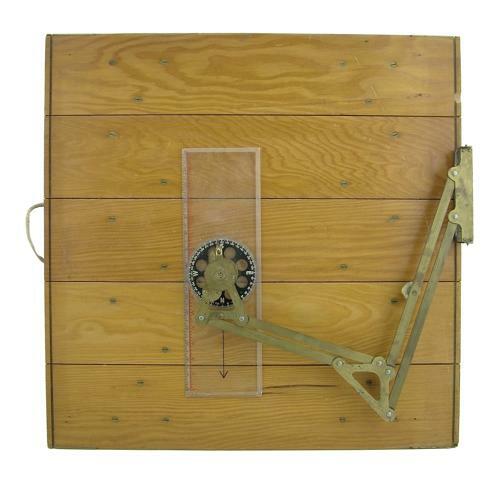 Wooden plotting board approximately 44 x 44cm fitted with jointed/articulated brass plotting arm and adjustable perspex rule. Green canvas pen 'pocket' to rear. Clearly marked to reverse with Air Ministry King's crown stamps, manufacturer's details and 1940 date code. Also has later 1953 re-issue date. The board has light marking and storage wear but is in very good condition. The plotting arm hinge has been soldered and lacks a screw but is in useable/working condition. These chartboards were balanced on the knees of early navigators and used to plot routes during flight. A lovely display item. Stock code M23343.